The problem of quick and effective adaptation of new employees is crucial for all IT-companies. When you hire a new professional which should be rapidly put in the picture to start working with a new project, delay means loss of profit. How can it be possible to accelerate the process of newbies’ adaptation in a company? Are there any effective instruments which can help to cope with such task with minimum cost and with maximum result? The answer to the second question is “Yes”, and the answer to the first question lays in workflow automation usage. Let’s see how it can be possibly done. Workflow automation solutions are software products which are able not only to simplify and automatize the work within a project, but also make simpler adaptation process of new team players. I have already mentioned Comindware here. Comindware Tracker has a specific solution for HR automation. One of the brightest distinctive features of Comindware Tracker is its working principle. The program functions through the window of a browser and you only need to be connected to the Internet to use the software. Simultaneous work is possible for all of the team players, so everybody, even remote users can easily access the required information from their computers. 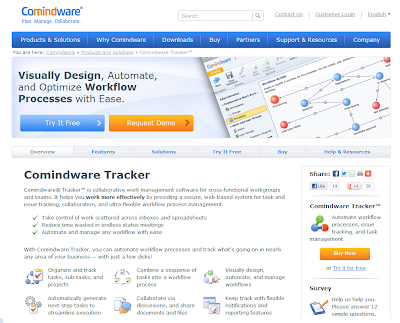 Comindware Tracker has been recently updated and now offers new features. The solution has now a mobile version which can be run on all types of mobile devices. It does not absolutely matter where the user is located and which mobile platform or operational system he utilizes. He will in any case have constant access to all the information required for productive work on the project. Another feature Comindware Tracker offers after the update is the opportunity to create new project tasks and items by email: you only send an email to a specific email address and then the machine of Comindware Tracker starts to work, give out tasks to your working team. Speaking of onboarding process the HR solution offers, you may send the initial email, the onboarding process starts. You can include necessary info, attach the employees papers to the email: Comindware Tracker will attach it to the item. At any time, it is possible to look through the current statuses of existing workflow tasks. The logic of the solution is quite simpler than that of its competitors which, in my opinion, makes work with Comindware Tracker easy and pleasant. Comindware Tracker comes with a free application, Comindware Task Management which allows to create and manage new tasks. It’s possible to download and use Comindware Task Management separately, but when you deal with HR workflows, you’re seeking for Comindware Tracker automation features first of all. 30-day fully functional trial of the solution can be found here. commindware doing a good work for employee onboarding..Nice work,Keep going..